The media launch for the Rain Dance Book Festival is in full swing. Check out the soon to be printed press page for Doubt, Among Us Trilogy 1 featured in the Rain Dance Book Festival Catalogue. We are excited to be launching Doubt at the Rain Dance Book Festival this weekend. Download the PDF press page here. We will be livestreaming the event, details to follow. Doubt is book 1 of the Among Us Trilogy which is about a group of outcasts (online gamers) who band together to investigate who or what is behind the catastrophic events happening around the world. Harry Doubt, a programming genius and creator of the virtual online game “Truth Seekers”, brings his gaming friends into undercover missions in the Middle East, Europe, and the USA to uncover the truth when his mother mysteriously disappears on a Global Nation volunteer assignment in the Middle East. Little does he know that there are forces more powerful than governments and more dangerous than he or his friends can imagine. Reluctant heroes, Harry Doubt and his group of gaming friends find themselves in a battle to save humanity. Register now to get free things, join in the book launch and learn about upcoming events. 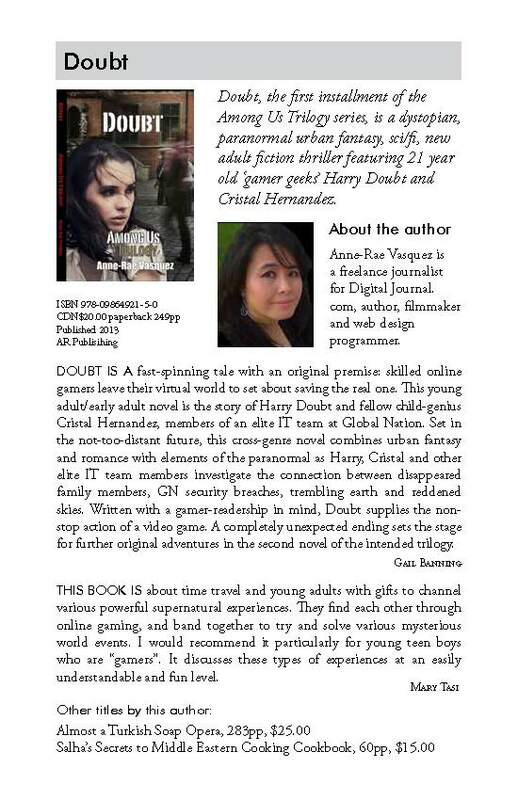 anne-rae vasquez, book launch Doubt, Doubt, press release, rain dance book festival, time travel, Truth Seekers game, urban fantasy, young adult. Bookmark.